Bukowskis is a Swedish auction house for fine art and antiques, established in Stockholm in 1870 by Polish nobleman Henryk Bukowski. Today, Bukowskis also has offices and showrooms in Göteborg on the Swedish westcoast (not far from the Norwegian capital) and Malmö in the southernmost part of the country (close to the Danish capital). There is also an office abroad, in the Finnish capital of Helsinki (Helsingfors). In addition to their regular auctions, Bukowskis put on a few Fine Art Auctions each year, featuring art and handicraft objects with especially high start prices. An notable example of an object sold at one of these auctions is Andy Warhol’s “The Last Supper”, who went for 50 million SEK in 2014. Bukowskis are also known for their special auctions, such as the one in 2009 when they auctioned out items from the Ingmar Bergman estate, and the one in 2012 dedicated solely to the Marabou corporate collection. During recent years, online auctions have become of very important part of Bukuwskis business model, making up approximately half of the annual turnover. Unlike online auctions sites such as eBay, the items offered for sale at Bukowskis’ auctions online come with expert valuations. Each month, thousands of items are sold at Bukowskis auctions online. Bukowskis gives you an 8 day credit when you buy something from one of their auctions. You need to provide payment during this time. If you need a longer credit then you need to arrange that through another loan provider. You can find a good Nordic loan provider here. In 2014, Bukowskis Real Estate opened, specializing in brokering real estate deals for properties that are culturally or architecturally significant, or found in rare and highly sought after locations. The auction house Bukowskis was founded in Sweden in 1870, by a polish nobleman named Henryk Bukowski (1839-1900). During his law school years in Moscow, Bukowski had become involved in the political struggle to free Poland from Russia, and after the failed Polish uprising of 1864 he fled to Sweden where he was given asylum as a political refugee. A few years later, he was hired by court jeweller Christian Hammer to catalogue the art collections of King Karl XV. In 1870, Bukowski opened an arts and antiques shop at Jakobstorg in central Stockholm, and from 1873 and onward he also held public auctions here. Bukowskis first major auction took place in 1873 and involved the sale of items from one of King Karl XV’s collections. In 1875, Henryk Bukowski became a Swedish citizen. 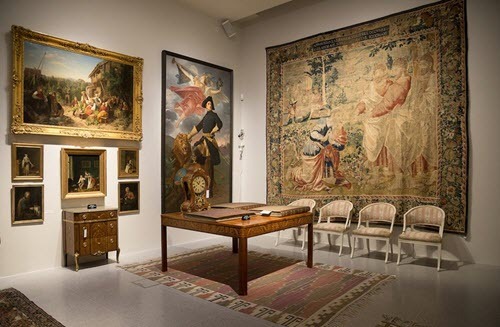 Some of the most highly publicised of all Swedish art auctions in the early 20th century was carried out by the Bukowskis auction house, as they held five record-breaking auctions featuring items collected by Christian Hammer, a Swedish-Norwegian art collector, jeweller and bibliophile. In the 1920s, Bukowskis gained a monopoly on selling etchings by renowned Swedish artist Anders Zorn. These etchings were so popular and high-priced that they could be used as collateral for loans in major Swedish banks. In 2014, Andy Warhol’s “The Last Supper” sold for 50 million SEK at an auction held by Bukowskis. This was a new record for the most expensive art ever sold at auction in Sweden.